One important factor in ensuring accurate, repeatable measurements in RF test applications is the stability of performance of the test cable used. In most test environments, cables undergo frequent bending during normal use, which can result in changes in phase and other performance parameters. 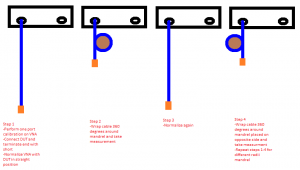 Depending on the cable, these changes can be significant enough to degrade the accuracy and precision of your measurements. Therefore, in choosing the right test cable for your needs, it’s important to consider how bending affects cable phase performance and how a cable is (or isn’t) qualified for stability of phase versus flexure. 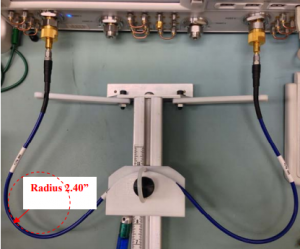 This article will review the basics of phase stability in RF coaxial cables and identify the factors that affect phase performance. Two methods of testing phase change versus flexure will be explored, and the preferred method used to qualify Mini-Circuits’ T40- and T50-series phase-stable cables presented and explained in detail. Where is frequency in Hz, is physical length in meters, is the dielectric constant of the cable material, is the speed of light in meters per second, and is the wavelength. Cables are typically designed to operate over a wide frequency range and minimize attenuation (loss). The longer the electrical length, the greater the loss. Since electrical length (and loss) is directly proportional to the square root of , most RF cables are manufactured from materials with a low dielectric constant, usually PTFE (Teflon) and in some cases SiO2. PTFE is more common because it’s easy to bend without damaging, while SiO2 is brittle and only suitable for semi-rigid cable assemblies. All Mini-Circuits’ cables use PTFE as a good degree of flexibility is needed in most applications. One drawback of the flexible PTFE construction is, of course, the potential for phase changes (and other performance changes) due to bending. Bending the cable changes the physical length at the point of bend. It may also constrict and loosen the dielectric, shielding, and braiding around the center conductor, which can also affect the electrical length and result in phase changes. Depending on the design and construction, some cables will exhibit greater sensitivity of phase with bending than others. Mini-Circuits T40- and T50-series cables are specifically designed and tested for stability of phase versus flexure. What follows will explain the methodology Mini-Circuits uses to qualify phase stability in these models. 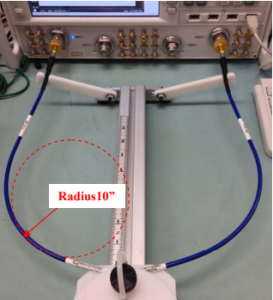 Measuring phase change versus flexure will involve connecting the cable to a VNA and sweeping phase across frequency with some setup to bend the cable into specified radii to show corresponding changes in phase. There are, of course, many setups we could conceive to measure phase stability, and the reliability of this parameter depends on the robustness of the test method used. Mini-Circuits has explored multiple test methods to determine the most reliable procedure to characterize phase stability in our test cables. The cross-bow-like fixture shown in Figure 1 was built as one possible solution for measurement of cable performance vs flexure. The apparatus has two adjustable arms to support the connector ends when connected to VNA ports 1 and 2. The cable is wrapped around a 4 inch mandrel which slides along the scaled bar, creating the specified bend radius. Figure 1 pictures the setup with measurements being made on Mini-Circuits model T50-3FT-KMKM+ at 10”, 3.25”, and 2.4” radii. 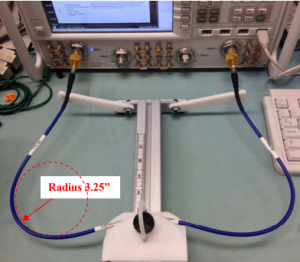 Figure 1: “Cross Bow” apparatus for measuring cable performance versus bend at 10”, 3.25”, and 2.4” bend radii. We would expect the relationship between bend radius and phase change to be linear. However, the data collected on the cable using this method exhibited a parabolic-shaped phase vs. flexure curve. This result is likely due to the multiple radial bends in the cable in this configuration: two in one direction, and one in the opposite direction. The data from this test is unusable because it gives the appearance of the cable being more resistant to phase change in tighter bends, which deviates from the expected performance. Figure 2: T50-3FT-KMKM+ using the “cross-bow” two port method, exhibiting a parabolic relationship between phase change and flexure. In the setup pictured in Figure 3, one-port calibration was performed on the VNA. The DUT (cable T50-3FT-KMKM+) was connected to the VNA and terminated at the end with a short. 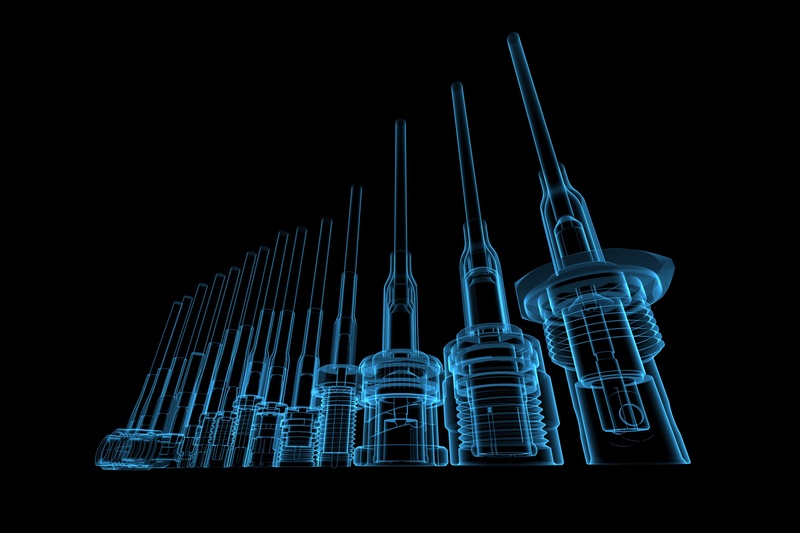 The VNA was then normalized in the straight position. The cable was then wrapped one full turn (360°) around a mandrel of specified radius in one direction, and measurement was taken by sweeping phase across frequency. The cable was straightened, and the VNA normalized again. A second measurement was taken with the cable wrapped one full turn in the opposite direction, around a second mandrel on the opposite side. This procedure was repeated for radii of 2” and 3”. Figure 3: Simple visualization of the one-port method for testing phase stability vs. flexure. The data collected on the cable using this method exhibited the expected linear relationship between phase change and flexure. This method avoids any effects of additional bends in the cable and other factors that may distort the measurement, and the data is usable. Figure 4: T50-3FT-KMKM+ using the one-port method, exhibiting the expected relationship between phase change and flexure. *S11 halved to obtain phase change. 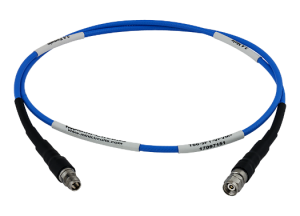 The measurement of phase versus flexure varies from company to company in the RF cable industry, and it’s important to understand how manufacturers spec phase stability when selecting a cable for an application in which this is a desired feature. Mini-Circuits uses the one-port method explained above to test phase stability in all of our T40- and T50-series phase-stable test cables. Data from this test is presented on the datasheet for all models in these families.